An independent nation within the British Commonwealth and part of the Windward Islands in the southern Caribbean, Grenada is known as the Spice Island. Well known for its nutmeg, cinnamon, ginger and vanilla, there are more spices in Grenada per square mile than anywhere else on the planet. Nutmeg is the most abundant spice, and Grenada produces about a third of the world’s supply. Grenada’s capital, St. George’s, is a picturesque city with red-tiled roofed shops and homes dotting the hillside of an old volcano crater. Its beautiful horseshoe-shaped harbor and yacht lagoon are unforgettable sights, and the town is a favorite port-of-call for cruise lines from all over the world. Rich in English, French and West Indian history, St. George’s is filled with beautiful examples of French and British Colonial architecture. There are numerous options for dining– from casual restaurants and take out to higher end restaurants featuring a variety of international cuisines. While traditional intercontinental fare is available, you wont want to miss the creative local cuisine which includes Grenada’s national dish, Oil Down, a one pot meal featuring salted meat, chicken, dumplings, breadfruit, and callaloo, made from young dasheen leaves and other vegetables, as well as a mélange of fresh local seafood, fresh produce and meats prepared with true West Indian flare. Nutmeg ice cream is another must-not-miss treat. For outdoor enthusiasts, hiking and swimming abound in Grenada. Concord Falls offers three waterfalls, one of which can be reached by car with the others requiring a hike to access, but all three offer great swimming. In addition, hikes to Grand Etang National Park and Mt. St. Catherine, the highest peak in Grenada, should not be missed for the magnificent vistas, wildlife, and stunning flora and fauna with many specimens unique to the Caribbean. The waters around Grenada support a vibrant array of sea life. Exploring the reefs just off the coast, snorkelers and scuba divers are treated to colorful tropical fish and other sea life. In addition, the Grenada Underwater Sculpture Park showcases sculpture reflective of Grenada’s culture in addition to acting as an artificial reef and playing host to a stunning array of varied marine life. Rentals are available for sailing, parasailing, diving, kayaking, windsurfing, and snorkeling to further explore the beautiful Caribbean waters surrounding the island. Grenada offers a variety of accommodations ranging from private villas, all-inclusive hotels such as, Sandals La Source and Spice Island Beach Resort, to boutique resorts and self-catered apartments. More information is available in our Visiting Campus section. 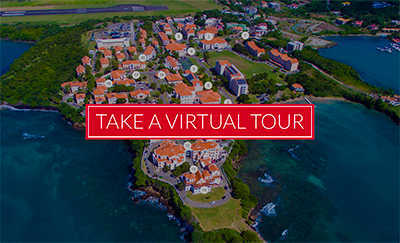 A brief look at daily life in Grenada is below, but for details on setting up bank accounts, getting mail, setting up cell service, and more, please visit the Accepted Students section. Although hours vary, most supermarkets open at or before 8:00 am and close as late as 9 pm, Monday through Saturday, with reduced operating hours on Sundays. Real Value Supermarket, located in the Grand Anse Spiceland Mall, has a good selection of foreign products as well as a deli and is open until 10:00 pm Friday and Saturday and 7:00 pm on Sunday. In the market square in St. George’s you will find primarily fresh fruits, vegetables and spices. The best selection is found early Friday and Saturday mornings. There is also an open-air seafood market in St. George’s which is open Monday through Saturday. The electrical supply on the island is of the type used in England, namely 220 volt, 50 Hertz. As most appliances sold in the United States are manufactured for operation on standard US current, 110 volt, 60 Hertz. On the True Blue Campus, all buildings have outlets providing for 110 and 220 usage. The National Water and Sewerage Authority (NAWASA) provides the island with clean, safe pipe borne water from a series of catchments, river and deep wells. Bottled water is also readily available. Grenada boasts of a modern-state-of-the-art telecommunication sector with FLOW providing cable and telecommunication services, LIME controlling the fixed-line telecom market and the mobile telecom market being serviced by both LIME and Digicel. Grenada enjoys one of the lowest crime rates in the western hemisphere. The Royal Grenada Police Force is responsible for civilian protection and defense. Grenada is also a member of the Regional Security System of the Eastern Caribbean.